I personally believe that brands aren’t helping us traverse this jungle that is skincare. Some brands take on such a hippy approach, with their essential oils and whimsical packaging and designs. Others take a hardline scientific approach, blinding and confusing us with scientific names of ingredients. Knowledge is a good thing. But too much knowledge can be dangerous and this is where I believe the issue is. When first dipping your toes into this mysterious world of beauty products, it is normal to want to read up on everything, and to try everything. Is the 14-step skincare routine trendy? Let’s do it! Is this new brand of skincare cheap and effective? Let’s have a go! Does beauty guru X use 15 items in her skincare routine? I want to do that too! 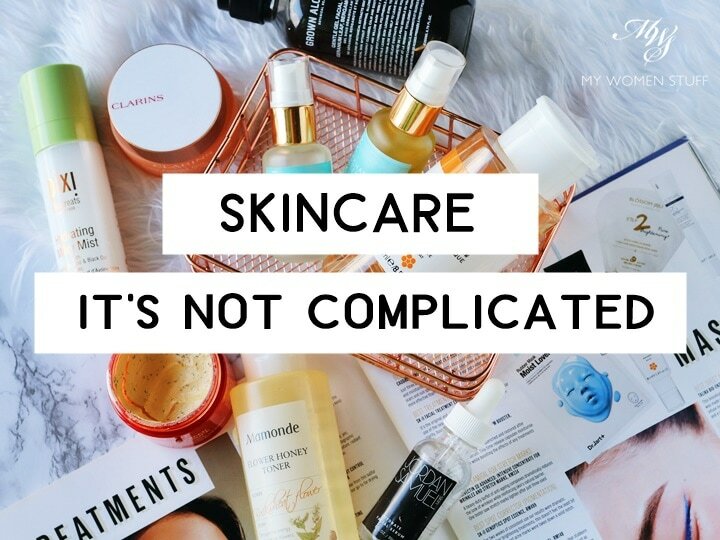 But you see, skincare is not complicated and it does not have to be complicated. You just have to bear a few key points in mind. Before you even start that 15-product skincare routine, think for a minute. Do you have dry skin? Do you have oily skin? What is the skin type of the beauty guru you idolize? Does she have the same skin type? Does she live in the same country or have the same climate as you? What so many people fail to tell you, is that you MUST know your own skin first before you can proceed. Is there a product that makes your skin feel better or look better? Is there an ingredient that you find irritating? Everyone loves cleansing oils, but does it make your skin feel dry? First, pick a cleanser that is gentle and non-drying. For those who share my drier skin type, or who have sensitive skin I suggest using milk or cream cleansers as they are less stripping to dry and sensitive skin. But for those who prefer a foaming type cleanser, or those with oily or combination skin types, pick one that does not strip the skin. Remember, you do not need your skin to feel squeaky clean after you wash. If it does, it’s likely stripped. Next, pick a cleansing oil or cleansing balm, or if you aren’t sure, here’s some guidelines on which to pick. This is for your evening routine, when a double cleanse is a good idea. Do note that if you don’t use makeup, you should still double cleanse. This first cleanse, usually with an oil based cleanser (balms are oil based, just richer), helps deep cleanse your skin and remove grime, dirt, makeup, sunscreen, and the like more easily. The second cleanse will be the cleanser you first picked. 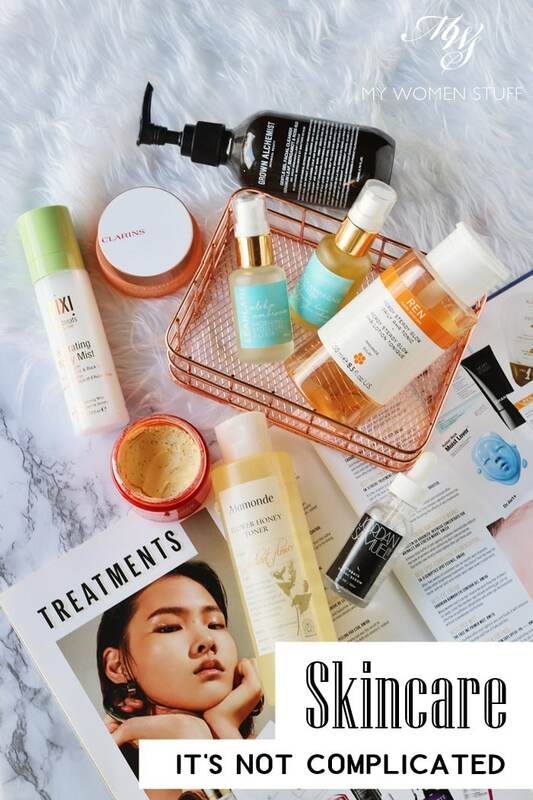 Double cleansing is nothing new to me, having learnt about it way back before I started blogging (first shared it here) and it has been a foundation of Japanese brand skincare routines for years. They make some of the best, affordable cleansing oils in the market! The reason I suggest you pick a gentle cleanser first, is because you can use the same cleanser in your morning and evening routine, thereby saving you one product. A while ago, I said on the blog that I didn’t believe in using a toner. But that was back when toners were not well explained, and were alcohol-filled, drying lotions. Today, I do believe in using a toner, but sparingly, depending on your skin type. All skin types can benefit from using a toning lotion that contains AHAs and/or BHAs. These help expedite skin cell turnover so your skin renews itself more quickly, and also helps clean your pores. This can help your pores look smaller, and your skin look more refined. However, I will caution against using these acid based toners too often, as they can potentially dry out your skin. Also remember, that unless recommended by a dermatologist, very high percentages of acids isn’t necessarily better for your skin. Sometimes, it is better to use something milder, but more often. I suggest using this as part of your night time skincare routine, and skip it in the day. Not only does it shorten your morning routine, it also prevents your skin from drying out too much (granted, based on personal experience). These days, there are decent products to suit most budgets. Go for Biologique Recherche Lotion P50 if you can afford it. But if it’s out of reach, consider the Pixi Glow Tonic or even the Hada Labo Mild Peeling Lotion with AHA and BHA. The reason I say this is a pillar of a skincare routine is because hydration is often overlooked, in the quest to treat skin problems. Yet, personal experience has taught me that well hydrated and moisturised skin will practically heal itself, and it will look better. This is true of all skin types. Hydration can help oily skin balance itself better so it isn’t dehydrated, and dry skin will naturally benefit from more hydration. I even find that my pigmentation problems look less noticeable when my skin is well hydrated and moisturised. Once you get your hydration product, learn to layer it like a moisture sandwich. You don’t need the 7-skin technique or even the 3-skin technique, modified or not. That to me, is overkill. What you need to do, is to layer your hydration under every layer of skincare that you apply. You can use multiple products for this purpose, or you can use just the one facial mist or hydrating lotion. The next thing you should consider is a product to treat your skin. This naturally may increase as you age or have different skin issues. But if budget is a problem, just get the one treatment product that you can use both day and night. “Treatment” here refers to a serum, which usually has a higher concentration of active ingredients. This is why it is more expensive. There are some brands that are more affordable. Work within your budget for what you need. There are a few treatment or serum options in this category that you can consider. This list may or may not be exhaustive, as I may not be aware of every product/ingredient/category in the market. I like to separate my skincare routine into two halves, so I use different treatment products day and night. In the day, I focus on hydration and brightening so I go for products that contain hyaluronic acid and Vitamin C. At night, I focus on anti-aging and use the necessary products. Remember that products containing retinoids or retinol should always be used at night as they can make skin sensitive to the sun and UV rays. Always wear a good sunscreen. Remember that your skin epidermis is very thin, just about 0.1mm. If you saturate all that with lotion as in the 7-skin technique, there is very little more that the skin can absorb. This is why I suggest layering your lotions between the other key pillars of skincare for better results. Moisturiser seals all that in, so pick one that suits your budget. In fact, it does not even have to be very expensive, as long as it feels comfortable. I have tried moisturisers that are affordable for most, and even those that cost an arm, leg and kidney. I’ll tell you that from my experience, it doesn’t matter, because what they’re supposed to do is deliver moisture to your skin, and seal in the rest of your skincare. I’d spend the bulk of my money on the Treatment step, and save here. Remember, sunscreen is not makeup. It is skincare. Your primer or foundation or BB cream with SPF does not take the place of a proper sunscreen. Your cream that contains SPF does not take the place of sunscreen. I personally use SPF50+ everyday, rain or shine, summer or winter. If you think that’s too much, then consider SPF30 maybe in winter, and scale up to an SPF50 in summer. If you live in high altitudes, the UV rays have a shorter distance to travel to damage your skin. So you can get UV damage even though it feels like you don’t get a lot of sun. When I was in Tibet, which is situated at a high altitude, we were advised to wear and reapply our sunscreen often. Those who didn’t bother, experienced sunburn even though it was cold. I really did want to say “I told you so” then 😛 I sometimes feel that the term “sunscreen” is a bit of a misnomer. If they call it “UV Protection”, I think it would be better received, especially by those who don’t see much of the sun at some times of the year. There are so many sunscreen brands in the market today that it is easy to pick one that will work for you. My preference lies with the Japanese brands because I feel that they are the most elegantly formulated sunscreens in the market, and effective. There is one for every budget, so pick one, and be generous. This is not the time to stint on product. Just because a product is lightweight does not mean you should use just a few drops. What you need is a generous amount, all over, for maximum UV protection. If you feel that eats into your skincare budget, then find a brand that doesn’t pinch your wallet so hard. Well, I think they are absolutely lovely, and if you are diligent, they are effective. At present, they are also very in, so there are many brands with many different types of masks targeting different skin concerns in the market. But I will go out on a limb to say that I don’t consider them a skincare pillar. This is especially so if you’re on a budget. If you have the budget for masks, then use them. They are a nice treat for your senses and your skin. 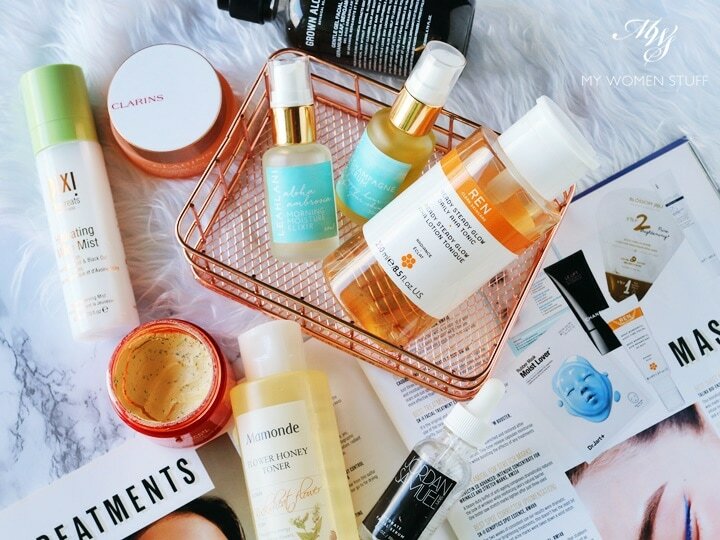 But if you have budgetary concerns, I’d channel that money into one of the skincare pillars I’ve detailed above for a more long-term benefit for your skin. PREVIOUS POST: I love the Melano CC Intensive Anti-Spot Essence so much I almost did not want to tell you about it! I have been a silent follower of your blog. Like to read your blog and what you said is so true. When I was younger, I used to follow blindly the most”in” facial product without recognizing my own skin type. Its through your blog that I realize that its the cleansing oil that has caused dryness on my skin. I stopped using and my skin has become better. I am now belong to dry and dehydrated skin type from oily combination. I guess aging really change our skin type. What bother me the most is the clogged pores on my nose and chin, sometimes its so rough when I touched my chin. Do you think acid toner might help to alleviate the clogged pores? Pleasure! I really hope it does. Clogged pores are the worst! I so agree with you. Masks are useful for oily skin and only then when they are diligent with them. Otherwise, their effects are all temporary, probably a good pick me up than anything else. I prefer to spend on facial oils most but these days I am looking into treatment serums as well. Hi Paris! I’ve been seeing a dermatologist for skin woes, and on one occasion I asked him about regular skincare routines. I was so surprised by his answer. He was of the opinion that toners of all types are unnecessary, and only became an essential because of marketing purposes. According to him, most toners claim to boost or enhance because they help weaken the skin barrier, hence making skin more receptive to the moisturizers and serums that come after (akin to bleaching hair so that dyes, perms and styling work better- strong, healthy hair are more resistant). I still think about this because it is new to me! He did agree with the other five elements that you mentioned here, especially hydration and sun protection. Wonderful article. I love how you break it down to the most essential steps. a little late to the party as I was away last week. Thank you for a wonderful post. I was too, one of those who followed the trend and went with the “latest/hyped” product only be left wondering why my skin isn’t any better. It was after a lot of reading and researching only I learnt that we need to address our needs and not follow blindly. Your blog has been a great source of information for me and your moisture sandwich suggestion has helped me tremendously. My skin has never been better. It is now clear & dare I say glowing ehem. Hi Shasha 🙂 I’m happy to know that the moisture sandwich method works for you too! Like you, I have run the gamut of skincare trends, only to realise that I’m just better off “creating” my own trend haha! 😀 I’m glad that my little anecdotes have helped someone, even if it may not appeal to everyone. I am all for going for facials, if not for a treatment, then for a little quiet time. Nothing wrong with that at all! In fact, I should be going for one soon. It’s an area of self-care I’ve neglected this year. How about eye moist? Can we use the same facial moist for this area? I do hope to receive your kind advice. Hi if you mean eye cream, it will depend on your skin. I personally rarely use a dedicated eye cream. I use whatever remnants on my fingers after applying my serum and creams, to gently apply around the eye area. However, if your skin around the eye is more sensitive, then a proper eye cream will be better as face creams can sometimes be too thick and cause oil seeds. If in doubt, best to use a proper eye cream and not use a face cream. If I’m slightly “rajin” but still sleepy, I usually do Cleanse > Tone > Overnight Mask for nighttime :D.
What if I do my skincare earlier at night right after taking evening shower? My friends even ask me why skin is so smooth and light. I live in Indonesia, sometimes i write about skincare advice or just review cosmetic product in my blog. I see an oddity of my colleague in choosing “lightening cream”, they do not care about harmful ingredient, like hydroquinone or steroid. They thought if this product could give me super fast whitening reaction, just take it. I often say to them, just take skincare with vitamin A or retinoid, and azelaic acid as the subtitue. What do you think about retinoid to lighten skin, Paris, you only say it is beneficial for pimple. Thanks for this write up! I’m entering my thirties and my health has taken a turn for the worst, and my skin along with it and my previous routine just wasnt cutting it anymore. It’s been quite overwhelming trying to figure out which products to use and how to use them. I am looking to get into facial oils but I can’t seem to figure out where they slot in. Somehow they feel like they’re part moisturiser, part serum and in that case, do I just forgo one or the other? I’m quite wary of layering too many products on the skin since I am prone to breakouts now that I’m older (such woes). I’m sorry to hear your health isn’t what it used to be Sharon, but the key thing is to focus on that first, to get yourself in tip top condition! 🙂 Yes, the skin does reflect our health, so I do notice that my skin suffers when I fall sick. As for facial oils, you can treat them as either a serum or a moisturiser, depending on how you feel. You don’t actually have to use very much – just 1-2 drops. Warm it up, then pat it on damp skin, and you won’t even notice it’s there! 🙂 If your skin feels comfortable with just oil then you can just leave off the moisturiser.